In a wide-ranging conversation at his office, the diplomat offers candid remarks about his hits and misses, about a behind-the-scenes look at what the job entails, and about the Atlanta Indian community. The collective karma of the Indian community of Atlanta must be good. The memories of the Houston Consulate which presided over Atlanta before Atlanta got its own Consulate in 2012 had been the stuff of nightmares for many. Media such as ours were flooded with complaints of widespread delays, a notorious level of inaccessibility, incompetence, and “devil may care” kind of customer service. In our February 2011 issue, we had published a scathing editorial titled, “A Chorus of Complaints against the (Houston) Consulate,” in which we had taken to task the presiding Consul General there. The Atlanta Consulate was announced amidst the backdrop of such a low point when it came to the consular needs of not just Atlanta Indians, but of the community throughout the Southeast. So when Ajit Kumar, a distinguished diplomat who was also disarmingly charming and accessible, came into our lives as the first Consul General of the Atlanta Consulate, the community breathed a collective sigh of relief. The Atlanta Consulate’s intent to improve upon the prior experiences of its constituents was soon readily evident. Brick by brick and pillar by pillar, figuratively speaking, Kumar laid the foundation of a Consulate that revived the faith of its constituents. Understandably, therefore, when it was time for Kumar to leave, the community was once again anxious about his replacement. Nagesh Singh, though, soon eased those concerns. Atlanta’s lucky streak continued as the community benefited from another fantastic Consul General in the intelligent, articulate, and proud Singh who built upon the work of Kumar, and took it up a few notches. In his three years in office here, Singh has relentlessly and successfully served as an effective liaison between India and the region of his jurisdiction (which includes Alabama, Florida, Georgia, Mississippi, South Carolina, and Tennessee.) Puerto Rico and the U.S. Virgin Islands are also part of his jurisdiction, but Singh’s major liaison-building work is in the six Southern states listed above. Indeed, most notably, Singh was successful in spreading the footprint of the Atlanta Consulate much beyond the city—to the entire Southeastern United States. Limiting ceremonial appearances and instead choosing to spend time on building strong networks and alliances with government and business leaders, Singh has been a vital link in promoting trade and goodwill between India and this region. Following are excerpts from a comprehensive interview. During your tenure in Atlanta, which are some of the accomplishments that you are most proud of? In other words what might be your legacy from your time as the Consul General here? I think the biggest challenge for us was that this was a relatively new consulate. My predecessor (Ajit Kumar), a great diplomat, was busy setting up house, buying this property and setting up the infrastructure. When I arrived, thankfully that basic infrastructure was already in place. But still we were a relatively new consulate. We didn’t have the institutional and individual linkages which consulates in New York or Chicago or Houston had. Houston has been there for about 30 years, but the others have been there for 60, 70 years. In my view, my major accomplishment is that we expanded our impact beyond Atlanta. We reached out to each and every town, city, and region where there was an Indian-American community, and built linkages all around—in the six states and two territories that we are charged with. We reached out to all the important institutions of the city, state, and federal government. We let them know that we are here to build political relations between our country and this region. We are here to promote trade and investment, both ways: Indian investments coming here, as well as investments from the Southeast U.S. going to India. We positioned ourselves as a consultant and facilitator for doing business between India and this region. On the consular side, which is the most public face of the consulate, and by which we are judged, sometimes harshly, we tried our best. We tried to create a very welcoming environment where at times, we interpreted the rules as flexibly as legally possible to help the applicants. We made ourselves available and accessible when our constituents needed us…somebody got shot in Lancaster, South Carolina, somebody met with an accident in Troy, Alabama. We were sending out our colleagues to see whatever help we could provide. I’ve tried to ensure that every email we get, and trust me, we get a huge number of emails, we respond within 24 to 48 hours. I monitor everyone’s email ID. And I ensure that everyone gets a reply. You have mentioned that you prefer that people reach out to the Consulate by email, because of the high call volume you get and the length of these calls due to the complexity of cases. Have you considered using call centers in India? How about outsourcing preliminary call handling to India so that your American staff only need to jump in where the first-tier folks in the call centers can’t help further? 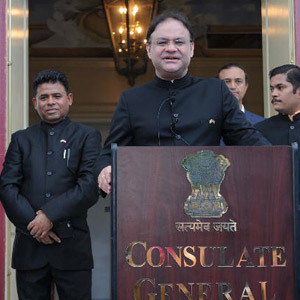 The government of India decided to outsource consular services, so that the initial calls, the initial processing, now, after a global tender, is being processed by CKGS (Cox & Kings Global Services). They have a call center in Mumbai. Technically, everyone should be calling CKGS, but it seems like people are still wary of calling them. Everyone insists on calling us at the Consulate. Someday perhaps it will happen that even the Consulates will have a call center. The Brits and others have it now, but they charge £5 per minute! If you call up the British Consulate to check on the status of your visa, they direct you to a call center, and the rate is £5 per minute! You know what would happen if we charge that much? We would get lynched! So the call center model is already being used by CKGS. There have been issues with that, too, but we are constantly working with them to pull them up. Things have already gotten better compared to the previous outsourcing agency. Can you shed light on some of the biggest opportunities in trade and commerce between India and the Southeast? And how has your office helped in capitalizing on these opportunities? Atlanta, specifically for us, is the Fintech (Financial Technology) capital of the world. It is the headquarters to Global Payments, First Data, NCR, etc. Now, if you look at the Indian economy, because of the movement to digital payments as well as because of national programs like the Jan Dhan Yojana (People’s Wealth Scheme), where we are trying to bring in almost 400 to 600 million unbanked people into the financial sector, there are massive synergies in the Fintech sector. Manufacturing and Logistics are other big areas of focus. FedEx, headquartered in Memphis, Tennessee, and UPS in Atlanta will be looking at India intently as it is heavily getting involved in the global supply chain logistics, thanks to the ‘Make in India’ initiatives. Similarly, the Southeast today is the automotive capital of the United States. Detroit and all are dying. Tuscaloosa, Alabama has Mercedes Benz. Greenville, South Carolina has BMW. Volkswagen in Tennessee, and Kia in Alabama. India, today, is the third or fourth largest automotive market in the world. We are also the fastest growing in this sector. We are the amongst the largest producers of automotive components. Now let’s come to aerospace. Again, India, is the fastest growing aerospace market. Domestic air travel until about 10 years ago was considered a luxury in India. Today the Boeing chief says that by 2026 we will be spending about $300 billion in acquiring 1600 or 1700 aircrafts because of the high rate of growth for air travel. Incidentally, North Charleston is the site for Boeing’s (787) Dreamliner. The Airbus is made in Mobile, Alabama. Gulfstream is based in Savannah, Georgia. Right here in Marietta, Georgia C130s are being made; we are buying them for the Indian air force. Florida is a big hub for simulators, air traffic control systems, etc., that are related to the aerospace industry. So that’s another industry we are working on. Of course, IT is obviously there. But that is happening pretty much on its own. But regarding the other sectors I’ve mentioned, we have been traveling to these states, talking to companies, telling them how India is evolving, how Indian companies are globalizing. For example, last year we had an aerospace and defense delegation from Tamil Nadu. They went to Jacksonville, Florida and Huntsville, Alabama, which is a huge aerospace center. And out of those initiatives, they created about a hundred jobs [in these regions]. Such delegations have been very fruitful. Today, as we speak, there is a 16-member delegation from Maharashtra in Birmingham, Alabama for the agriculture and agro processing industry. We had a similar delegation from Tamil Nadu, and one coming up soon, because this region is very strong in agriculture, agro processing, forestry, poultry—all of which are very synergic to India. We have been spreading the message that India is not just about outsourcing. Our companies are also creating jobs. How many people here know that Novelis is an Indian company in Atlanta? It’s an 8-billion dollar takeover with 2 billion more in fresh infusion. I don’t think many people know that India has a 10-billion dollar company here. So it’s important to spread the message that we are not here to take away jobs, we do create a lot of jobs, and not just in IT, also in other areas including manufacturing, hospitality, health care, etc. Were there any misses? Things you had hoped to accomplish that have not happened yet? Oh, quite a few. In the trade and investment side, we could have done much more. My biggest regret is that if you look at Florida—which is almost a trillion dollar state, the fifth largest in the country—there we have lagged. One reason is that Florida is very Latin America-centric. Only now they are getting interested in us. After the economic crisis in 2008, Florida realized that putting all their eggs in the Latin America basket was not a good idea. So I decided last year that we will call it the ‘Focus Florida’ year, because it’s going to be almost a one trillion dollar economy—half the size of India’s economy. And there are a lot of complementarities—in agriculture, agro processing, healthcare, IT, the financial sector, aerospace, defense. Considering all these complementarities between our two economies, I would have liked to see much more done with Florida, but it didn’t happen. I am looking forward to my successor doing something about it. On the community side, I wanted to bring the community together. That’s where I failed, and I gave up after the first six months. When I came in June of 2015, on the first Independence Day, I had about 13 invitations for flag hoisting. I was new; I was trying to be the people’s CG. We accepted them all. But when I came back exhausted I said, listen, if we all come together, there’s strength in numbers. Let’s do it in Centennial Park. We will have 10,000 people there, and let the mainstream society know what we count for. We have close to 145,000 Indians in the metro area. That’s a fairly large number. We should be amongst the forefront of everything which goes on in the city, but we are not. This is my biggest disappointment. I wish I could have brought everyone together. Interpersonal differences, that’s human nature, but I wish we could set that aside, and handle our differences. Nobody says we have to become uniform, but at times for a greater cause, we can set our differences aside. How much influence does your office have with the Indian Ministry of External Affairs in recommending changes in how the consular and visa services are executed? What, if any, enhancements did you bring in delivering these services? We are like an outpost of the Embassy. The Passport Act and visa policies—these are decided at the level of Delhi. Here, we may look like a large office, but we are just a tiny spec in the Ministry. The Embassy in Washington is like our Mothership. Policy framing is done in Delhi. Of course we are asked for input, and we send those routinely to the Embassy. The Embassy then collates those inputs—because each Consulate is different. An established large community has different issues. Regionally also, California is at a different level, we are at a different level, Houston is at a different level. So they collate the input, and try to find the common issues, and then the Embassy gets involved with Delhi. So we do matter in terms of implementing improvements and relaxation of document requirements. But we do need to educate the people through publications such as yours that we don’t make the rules. Some of them are made at the Parliamentary level, and even the Minister of External Affairs can’t do anything about it. Three years seems too short a term for your office. Just when you have solidified your relationships, and have become familiar with the subtle nuances of how things are done here, it is time to go. Wouldn’t the bilateral relations be better served if you had a longer term? I know the question you are asking is out of affection for me. I think individuals in these institutions are not important. Institutions are important. People better than me have come in the past, and people better than me will come in the future. We have some best practices, or lessons learned from my three years, and I will be passing them on to my successor. Obviously, the more you work somewhere, it gets better. Ideally four would be better, that I agree with you, because it takes about 6 months to just get oriented. But each posting is different. Before I came here, I was in a country called Senegal, a small developing country. It didn’t take much to get to know it. But when you come to the United States…the region I cover, the GDP of it is more than $3 trillion. Just the city of Atlanta is about $330 billion, which is more than many countries. And GDP reflects the complexity of the region. Seventeen Fortune 500 companies are headquartered here. So it’s a vast, complex economy that takes a bit longer to comprehend. But, that said, we are public servants. The individual is not important, the institution is. You say that, but isn’t there something to be said for personal relationships you may have built during your time here? For example, with Jeremy (Pilmore-Bedford) at the British Consulate, you likely have a relationship where you can pick up the phone casually and get things done. A new person would have to build those personal relationships from ground zero. But by the time I leave, in my “Handing Over” note, I will be telling my successor (Dr. Swati Kulkarni, the incoming Consul General) that of all the people in every city or state, whether it is Florence, Alabama, or Memphis, Tennessee, or Columbia, South Carolina, these are the people whom you need to work with. When I came in, I didn’t get these connections. Now I have built a kit which will convey all the information…these are the contact people. You have a problem at the airport, call so and so; you need to talk to GBI, talk to so and so. Going forward Dr. Kulkarni will not have to concentrate on this work which I had to do. And she will do something beyond that. So there’s a continuity, and I think it works well. On that note, how seamless or not is the transition between one Consul General and another? It’s quite seamless, because the Consulate is not just me. There are 20 to 30 people working here, and we are all coming here after having put in 23, 24 years of service, being in different countries. It is pretty seamless because the manpower remains the same. They brief the leader. The leader’s working style may change, but functionally it’s not a problem. Are you at liberty of sharing some items from your “handover note” to the next CG? Yes. First, the diaspora itself, it is very important. I’ll tell her of some of the lessons I’ve learned in dealing with the diaspora. Not to waste time on trying to do things which we think are good, but to accept the reality of the diaspora, in terms of its diversity, its views. Secondly, reply to everyone, however absurd the inquiry. So even if a guy asks me if I need a visa for Bahamas, I will politely direct them to the Bahamas Consulate and ask them to check with them. And, very important: be very equitable in dealing with everyone. No favoritism. That helped me a lot, at a cost though. That’s the crux of diplomacy, right? Absolutely. Although, Parthiv bhai, we are also human beings. I have friends from my New York days, my Paris days, Senegal days. Beyond work, I want to be friends with you. But what I have seen here is that if I am seen with you, there are 20 others who want to question that. I get anonymous emails accusing me of favoritism. So I stopped going to people’s houses for lunches and dinners. I have a few friends where I go, but I tell them… no photos, no Facebook…nothing. And I am not bragging about this. I am sorry for myself, that I can’t more freely be friends with those I want to. Don’t get me wrong, the community was very nice to me, too, so don’t let me act like a victim. The warm welcome when I first came, and the continued affection have also touched me. Now that you have had three very engaging years with the Atlanta Indian community, do you have any observations about how this community in particular differs from other diaspora communities in places that you have been posted? First of all, it’s a very educated, successful, enlightened diaspora compared to a lot of other places where I have served. It is very well integrated…although we could do more in terms of giving back to the society we live in. This diaspora is very connected to the mother country for which we are deeply grateful. I talk to some of my other colleagues from other countries, and some of them tell me they don’t even know the number of our countrymen in their region because they are not engaged with the Consulate. Here they are all very well connected, and are a symbol of the mother country. It’s a rapidly growing diaspora, especially in this region. It’s a very diverse diaspora. At last count Atlanta had about 206 associations based on every state, religion, language and region. What’s your farewell message to the Indian community here? What I would like to see (just as an Indian citizen, because who am I to preach to them in any formal capacity?) is to start giving back to this society. We get a lot of offers, like “we want to sponsor some villages in India for education or water resources,” etc. But I say to them, “That, we will take care of.” Why don’t we, for example, help the Atlanta public school system? Or, in South Atlanta you see a lot of poverty—why don’t we do something about that? Some groups do, but I say let’s give back to where you are living and raising families. We all want to build temples, and I am a Hindu so I don’t have anything against temples, but aren’t there enough already? Why don’t we get together and start, for example, an Indian study center in Georgia State University? We need to get more and more engaged with public life here—at city, state, county, whatever level. Be good engaged citizens. Register to vote, vote, make yourself heard—because if you become strong Americans, it strengthens our Indo-US relations as well. We consider all of you as ambassadors of Indo-US friendship. As to our poverty and illiteracy and all that, we will take care of that. India doesn’t need your charity. I keep saying that India runs an aid program itself. We have an almost 3 billion dollar aid program for Afghanistan, which I worked on in one of my previous assignments. So we don’t need these organizations to build some toilets [in some town in India]. We are giving aid to the world. In 2015, India gave a $10 billion line of credit to Africa. So India doesn’t need your charity. That’s been my mantra, although I realize it goes against the conventional wisdom. What we need is your technology, best practices, your technical know-how, your networks. Help us connect the people and institutions back in India to your network, whether it is in science, or technology, or healthcare, clean energy. If you are a thought leader in your field, go to India, give a talk.